For decades, we’ve all been sitting through FBI warnings before our movies. Those warnings tell us that sharing media is very wrong, piracy is bad, and we will all get into trouble for doing it. So the operators of file-sharing torrent sites know they might end up on risky legal ground. But what they might not expect is to have their websites removed from the internet for them before they even know they’re being sued. News site TorrentFreak points to two different instances this week of copyright holders aggressively chasing down suspected infringers, and courts being happy to play along. 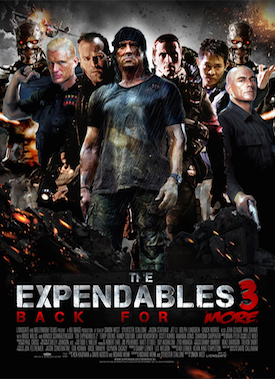 The first involves film studio Lionsgate, and their new action flick The Expendables 3. A high-quality leak of the movie first hit torrent sites a month before release, and immediately got snapped up over 100,000 times. In response, fearing for their profits, Lionsgate issued thousands of takedown requests and filed lawsuits against six major file-sharing sites. To be fair, Lionsgate was right to worry about their movie’s ability to make money. The film did not do well with its opening box-office numbers, coming in fourth on its first weekend out. It was out-performed by Teenage Mutant Ninja Turtles (which opened two weeks ago), Guardians of The Galaxy (opened three weeks ago), and Let’s Be Cops (new in theaters). However, piracy may not be the biggest driver behind those low box-office numbers. After all, Game of Thrones is the most-pirated show on television, but still is extremely successful ratings-wise. That The Expendables 3 currently sits at a ripe, mushy 35% on Rotten Tomatoes is probably the bigger contributor to its poor performance. This isn’t Lionsgate’s first foray into lawsuit territory. The first Expendables movie also leaked, back in 2011, and 23,000 BitTorrent users got sued over it. This time around, Lionsgate is wasting no time going after the distributors of their content. A court in California had granted Lionsgate an injunction that basically let them go in and stop the file-sharing sites themselves. And the injunction applies not only to the torrent sites, but also to “all companies that provide services to or in connection with the sites,” as TorrentFreak explains, which includes hosting services and domain name registration. The sites also had all their assets frozen. That was August 8, eleven days ago. And by now, the torrents have indeed nearly all vanished, according to TorrentFreak. But the effects from the current wave of lawsuits have spread out farther than just the file-sharing sites. Not only have the torrent sites all pulled the files (with no new seeds taking their place), but also torrents of the film have virtually disappeared from Google search results. TorrentFreak notes that this wide-ranging and immediate legal response to a piece of pirated media hasn’t been seen before. However, something like it is already being seen again. And it’s not just American companies going gung-ho for lawsuits, either. In a separate incident, a Philippine company has filed suits in federal court in Oregon against a dozen file-sharing sites. As TorrentFreak reports, the company, ABS-CBN, requested a temporary restraining order against the sites. The request was sealed, and the sites being sued had no idea they were being sued until suddenly the court agreed to have them taken offline. The temporary restraining order “allows the media company to order hosting companies to take down the servers, domain registrars to seize the domain names, and search engines to remove all results linking to the sites,” according to TorrentFreak. ABS-CBN was also granted access to the sites’ webmaster tools, in order to prevent any of them from redirecting their traffic to other domains and continuing operation. The company has redirected all of the sites to a copy of the legal complaint, and none of the URLs now appear in Google search results. So in two separate instances, in two different courts in two different states, private companies have now essentially erased the sites they are suing from the internet — before the cases can actually be heard out and take place. The shotgun approach to copyright infringement can have unintended consequences. TorrentFreak also points out that takedown requests seeking to limit the leak of The Expendables 3 not only targeted torrents and torrent sites but also targeted news sites that ran stories about the leak — and even included the movie’s official website on the list of URLs that were supposedly up to no good.